APHRODITE – WHY IS IT SO EXPENSIVE? In a small town like Antigonish it’s normal for people to ask that question. After all what do we have to compare to? Winners? Wal Mart? Beyond the Rack? In a big city it’s easy to find clothing that triples our prices. But here – what distinguishes a store like Aphrodite from the familiar franchise and big box clothing retailers and online shopping sites? That’s a big question and I would like to provide some insight for our readers into the fashion industry. Most fundamentally, Aphrodite is an independent retailer. As a buyer I spend several weeks every season searching for the most beautiful apparel and accessories I can find. Each buying season (February for Fall/Winter and August for Spring/Summer), I travel to showrooms in Toronto and Montreal that represent the newest collections from independent fashion houses across Canada, USA and the world. Six months later those fashions are delivered to you – our customer – in a beautiful environment with skilled sales staff employed to take care of you. I stay away from the big American companies like Ralph Lauren, Donna Karan, Tommy Hilfiger and Liz Claiborne. They have, in my opinion become over commoditized – they are found in every big mall in every city in North America and Europe. Instead, I look for smaller lines with great design, excellent quality and beautiful fabrics that aren’t readily available anywhere else. I love finding that Aha! garment that just comes to life when it’s tried on – like some of the new Sarah Pacini pieces that we have just started carrying. It’s the highest priced line I’ve purchased for the store, but ironically this fall the Sarah Pacini collection has been our best seller. It’s not hard to see why. That leads me to the underlying philosophy – never underestimate the customer. When she experiences beautiful quality and style she recognizes the value and is willing to pay for it knowing that garment will make her look sensational for many years to come. We are catering to the woman who expects above average in every part of her life. She is confident, intelligent and cares how she presents herself to the world. She is who we buy for. My fashion philosophy is to invest in a few very good pieces that are expertly designed to work with many looks – rather than a lot of trendy inexpensive pieces that never quite hit the mark. When you have one good piece – you can wear it for years and it always looks great. A good coat can look new for decades! In contrast companies like Joe Fresh are about cheap fashion above all else and while they are a hugely successful brand – they stop short at quality. They employ teams of pattern makers who copy what the real designers are doing – then take those designs to the cheapest manufacturing facilities in countries like Bangladesh where they are knocked off and shipped out by the millions. These garments are made by workers who are exploited at all levels. After the devastating fire in Bangladesh that killed over a thousand workers, the world found out about the hideous conditions they work under for an average monthly pay of $14.00. That’s the human price of cheap. I mentioned risk – that’s what everyone in the trenches of the fashion world is taking every season when they introduce a new collection. Designers that we carry at Aphrodite like Eve Gravel, Dinhba, Lauren Vidal and Sarah Pacini pursue their own art form independent of formula driven designing that caters to the masses. They are trained and talented fashion designers setting the trends, investing in new looks, fabrics and the costs of bringing a collection to the market. This is where we find true originality, quality and exciting fashion. And risk. For the most part as a buyer and manager I’m also participating in a great risk factor because none of us has any assurance that you, our customer is going to buy what they have designed and we have selected. What happens when that risk doesn’t pay off? Enter the dominant clothing retailer in Canada – Winners. They buy up leftover lots of clothing from designers and retailers that didn’t sell out in the season they were presented. In essence they buy up residual garments, often the mistakes – at a few cents on the dollar and bring them to market at great discounts while still making huge profits themselves. They are the industry’s other bottom feeders. It’s all about fast profit – nothing to do with fashion. The same is true of many online clothing clubs like Beyond the Rack and Haute Look. You will seldom find first run fashions – again they operate on the same principle as Winners – they buy up leftovers from the industry at cheap prices. That explains why often the fit is not quite right and invariably the garment you receive does not compare to the online photo. At Aphrodite we see firsthand the desperation of a disappointed online customer shopping at the last minute for her special occasion dress. There’s nothing that can replace the good old fashioned store with a great selection readily available for you choose from and try on the perfect outfit. We pay fair prices for the merchandise we carry helping to sustain a healthy independent fashion industry in Canada and the world. We know that the clothing we carry is manufactured in safe environments where workers are paid fairly. We hand pick a superb selection of clothing in small quantities per style so you can be sure you’ll find just what you’re looking for and won’t see yourself at that big event. We deliver superb customer service on top of that. When you shop at Aphrodite we work with you as your personal fashion consultant. You give us a direction and we bring you the pieces that we know will work best for you and then we’ll show you how to wear them for maximum impact. We get to know you and your preferences so you end up with something that you really love and feel good wearing. And we will hem and alter the garment (for free) so it fits you perfectly. With a planned approach for your seasonal wardrobe you actually end up saving money. (Think of all the sale and discount items in your closet gathering dust). In fact, now when I do my buying I have specific customers in mind when making my selections for the next season. This kind of service is almost an outdated concept in today’s world but so far it’s working for us. Aphrodite has become a destination for women across the province and beyond who shop here and regularly tell us it’s the most beautiful store anywhere. We like to think of our shop as one that delivers gourmet clothing as opposed to fast clothing. Yes you pay more than you do for “fast fashion” but one thing is for sure – you get what you pay for! PS. This article has drawn a lot of attention. Here are some of the comments I received in my email box. Thanks to all of you for weighing in – keep the comments coming! I just read your article ‘’ Why is it so expensive’’…..very well written & explained. Bravo! Too bad one nasty person had bad comments, I think she is the one that is snooty , definitely not you. Outstanding essay, Tiiu. You told me things about online sellers and discount retailers selling designer labels that I guessed were not kosher but didn’t understand exactly why. As a customer, I’ve noticed all the problems you mentioned in your article. You are an amazing business woman and you have such an outstanding eye for fashion. 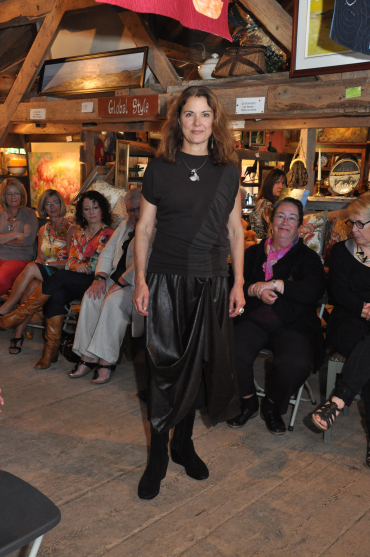 Aphrodite is a Nova Scotia treasure; I’m thrilled every time i step in your door by the quality and beauty of your clothes not to mention your other wonderful products and art work and your capable, warm and personable sales crew ( I love those women! ).